Pallas Kunaiyi-Akpanah dribbles the ball. 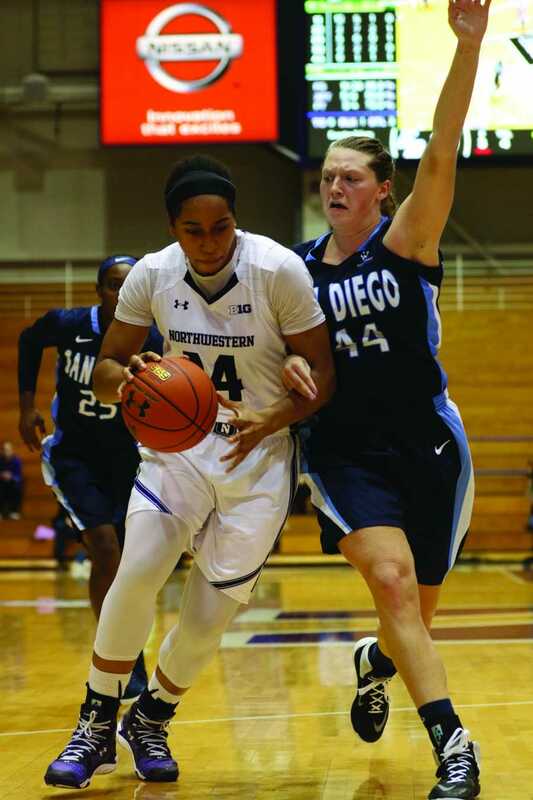 The sophomore forward’s big rebounding day breathed new life into an uninspired NU offense. Halfway through its road matchup with Minnesota, Northwestern seemed destined for another ugly performance. However, the addition of sophomore forward Pallas Kunaiyi-Akpanah to the second half starting lineup turned the game around and gave the Wildcats a fighting chance before falling 71-61. Kunaiyi-Akpanah ultimately finished with eight rebounds and a block, and provided NU with a key interior presence. With the forward on the floor, the Cats limited the Golden Gophers to 8 points as they secured the lead briefly before the hosts ran away with the win in the fourth period. The forward’s impact was felt immediately. Amid a sloppy start, NU struggled to score and rebound against a Minnesota team that excels on the boards. But upon entering, Kunaiyi-Akpanah helped steady the visitors, grabbing four rebounds in just two minutes of play. She was plus-14 in just over seven minutes of play to start the third quarter. The Cats opened the half on a 13-1 run, a surge that helped them outscore the hosts 26-12 in the third period. Beyond the rebounds, Kunaiyi-Akpanah drew just one whistle in the period and avoided foul trouble, which plagued her last season. The sophomore has only played limited minutes throughout much of the year and didn’t make an appearance in the first half. Senior Allie Tuttle started the game and freshman Abi Scheid played the majority of the minutes at center in the first half for NU. Kunaiyi-Akpanah, while a strong defensive center and rebounder, limited NU’s offensive effort outside of Coffey’s 33-point performance. The Minnesota native dominated in her final homecoming, shooting 10-of-26 from the field and grabbing ten rebounds while only committing two turnovers. Coffey’s contributions were matched by few others, with Kunaiyi-Akpanah’s impressive rebounding display among the few silver linings in the loss. The sophomore’s four points tied a season-high and were the team’s third most on the night. Kunaiyi-Akpanah hasn’t seen the floor much this year and didn’t play for an entire month of the season after playing in 32 of 35 games last year and starting 20. She has started zero games this year and has averaged only 6.3 minutes per game, compared to over 19 per game last year. But on Monday, the forward proved she still can still make a difference when her number is called.